The TAILS program has saved more than 500 at-risk dogs. 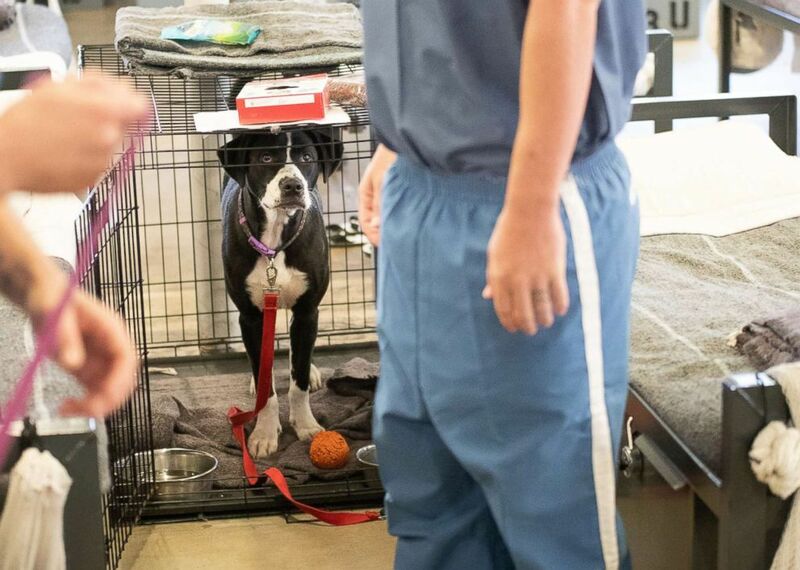 Hard-to-adopt dogs are starting to symbolize a ray of hope for inmates in Florida who qualify to enter a program that rehabilitates both them for their release back into society, and the dogs as they search for their forever homes. 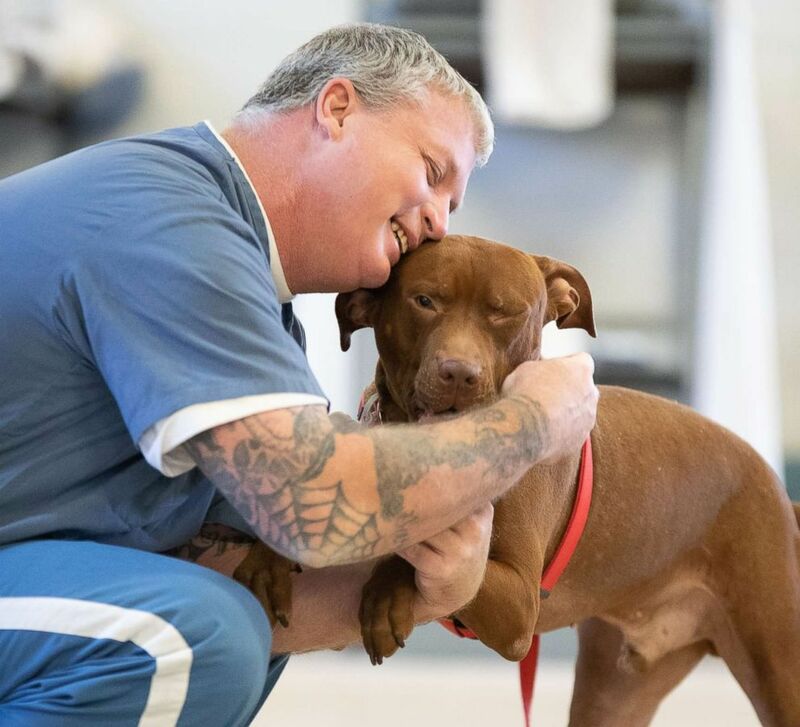 The Florida Department of Corrections-approved TAILS program -- which stands for Teaching Animals and Inmates Life Skills -- focuses on pairing at-risk dogs with institutionalized men. The at-risk dogs are categorized as those that would have been euthanized or were seized from dog-fighting, abusive or hoarding environments, Jen Deane, executive director of TAILS and Pit Sisters, a Jacksonville-based organization that takes dogs in need from city shelters, told ABC News. The program costs about $80,000 a year to run and is funded entirely by Pit Sisters and donations. "We take the dogs that need us the most," Deane said, adding that they live at the correctional facilities full-time for the duration of the program and sleep in crates next to their trainers in dorms that house several inmates. "It's amazing to be able to witness." Training typically occurs outside or in the visitor's room, where Goldberg has taken photos before, but the Florida Department of Corrections gave him special permission to spend time in the dorms, giving him a "rare" glimpse into the restricted area where the dogs are cared for "around the clock," Goldberg said. (AGoldPhoto Pet Photography) Dogs from the Teaching Animals and Inmates Life Skills program, or TAILS, live in the Putnam Correctional Facility in Palatka, Fla., and sleep next to their trainers and handlers in a dorm that houses several inmates. Often when he arrives, the prisoners are "scowling and don't want to be there," but all that changes when the moment comes that they get to interact with the pups. "When they're training the dogs, it's an escape," he said. "They're smiling and interacting with the dogs that they're training." One of the commands Goldberg witnessed the dogs practicing was "count time," in which the dogs go to their kennels when the facility staff counts the inmates. Another command is pray, when a dog places two paws on an inmate's arm. They also were trained how to sit and lay down, Goldberg said. What struck Goldberg the most about the photo shoot was his proximity to the inmates' living conditions -- the beds, the footlockers, and the fact that the inmates have to sleep next to individual rolls of toilet paper, something that most in society "will never see." The program involves a "very strict process" for screening both inmates and dogs, Deane said. Inmates who have been charged with any violent or animal-related crimes are not eligible, and they also cannot have had any behavioral issues while incarcerated, so participating in the program is essentially a reward for good behavior. Even after the dogs graduate, the inmates are permitted to stay in the program and get a new dog "pretty quickly," Deane said. "We are cautious of who we allow to interact and train with the dogs," Deane said. 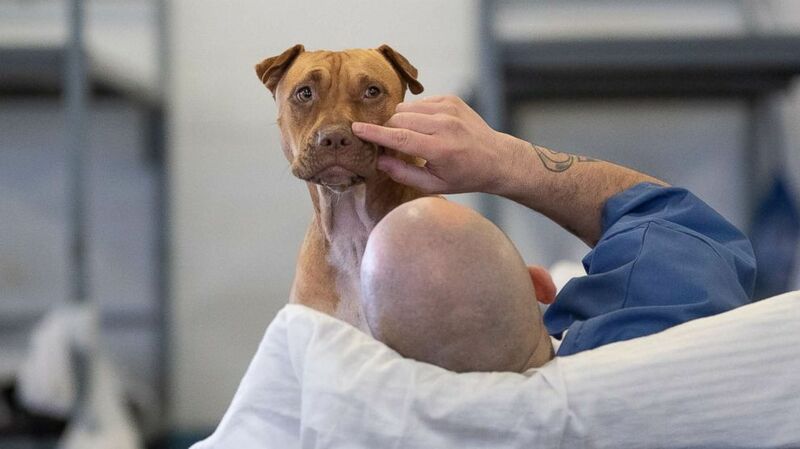 (AGoldPhoto Pet Photography) The joy the inmates gain from interacting with the dogs in the TAILS program is almost instantaneous, photographer Adam Goldberg told ABC News. The curriculum -- which typically trains four to 11 dogs at a time -- takes about two to three months to complete and is internationally recognized through the Association of Professional Dog Trainers, giving inmates professional experience for their resume. The program is not yet available at any women's facilities, but Deane and her colleagues are in talks to launch TAILS in a girl's juvenile facility in North Florida, she said. "We know that the human-animal bond is very powerful." Many of the inmates come from broken families and have never experienced unconditional love -- until they come in contact with a pup whose survival depends on them, Deane said. In addition, because the dogs often come from broken, storied backgrounds, the inmates identify with them. "They see themselves in the dogs," Deane said. Wesely, who is studying focus groups of inmates who have participated in the program, is looking at how the program can affect "criminogenic masculinity," or the idea that some marginalized men grow up in conditions or cultures where they don't have access "to the mainstream ways to be a man" and "learn lessons through abuse, poverty and social exclusion." Through her research, Wesely is trying to determine whether the "powerful" human-animal bond can interrupt "criminogenic masculinity" traits such as risk-taking, never backing down and violent behavior, resulting in what is essentially an identity change. "A lot of these guys had early lessons in masculinity," she said. "They learned through very abusive behaviors that they could never show weakness. They had to kind of shut down that aspect of their identity in order to survive." 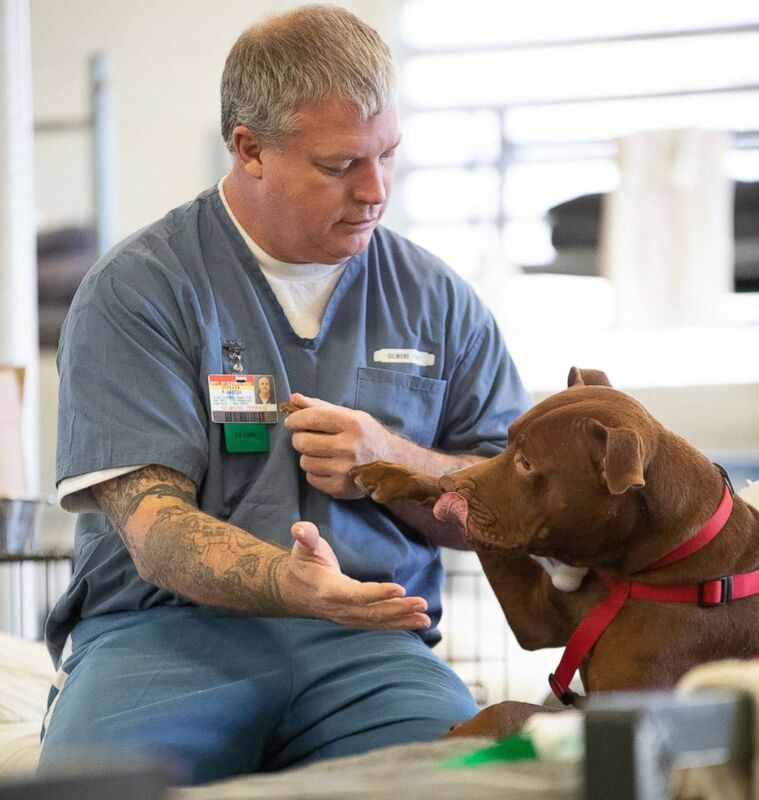 (AGoldPhoto Pet Photography) One of the commands the dogs in the TAILS program learn is to "pray," which involves placing both hands on the inmate's arm. Deane noted that the program isn't intended just to teach the men how to train, but to help them "assimilate back into society." Out of the "hundreds and hundreds" of participants she's spoken to, their "number one concern" is how they will fit in when released back into community, she added. "The program teaches the guys empathy, patience, responsibility, teamwork, and it teaches them about love," she said, adding that she's witnessed the transformations first-hand. Many inmates told Deane that participating in the program was the "first time they felt unconditional love" and the "first time they were able to care for someone other than themselves," Deane said. Because the program teaches positive reinforcement, the inmates who have children have also expressed to Deane that it has made them better fathers, she said. Deane could go on all day about the number of inmates she's seen thrive after completing the program, and she's constantly writing recommendation letters for former inmates once they get out, she said. One inmate who "excelled" in training decided he wanted to be a dog trainer when he got out, so TAILS gave him a scholarship to become certified, Deane said. When he moved south to Palm Coast and was in need of a job, Deane then called the executive director of the Flagler Humane Society, who hired him as a kennel technician. The former inmate was soon promoted to head of adoptions at the shelter and is now working as a veterinary technician, Deane said. "He really did extremely well with it and is still doing it," Deane said. "And he learned that that's what he wanted to do from the dog program." More than 500 dogs have completed the program and through Pit Sisters have either been adopted, are being fostered or are being housed in a commercial space the organization leases, Deane said. "That was one of the goals of the program," she said. "We spend all this time training them, we want to make sure they’re not sitting back in a shelter." 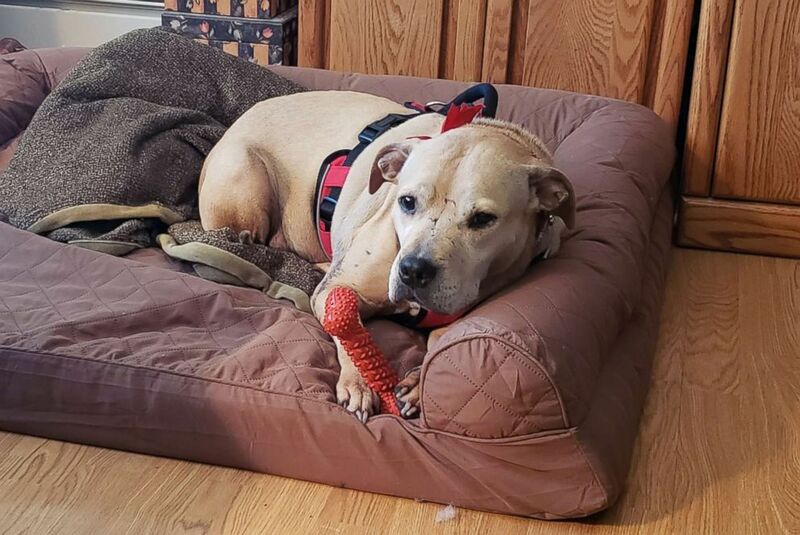 Canine aggression and behavior expert Jim Crosby described one particular success story in which a tan-colored Pit bull named Cuddles was seized as part of a dog-fighting arrest in Canada and had been determined to be too dangerous to be placed in a home. All 21 dogs seized from that environment were supposed to be euthanized, but an animal welfare group intervened and got permission for Crosby to fly there to evaluate them, he said. Once he got there, he determined that only two of the animals were "bonafide human dangers," and that the rest had a possibility for a second change. "Cuddles was one of those dogs," he said. (Courtesy Pit Sisters) A pit bull name Cuddles was initially deemed too dangerous to be placed with humans after she was rescued from a dog-fighting environment in Canada. (Courtesy Pit Sisters) After completing the TAILS program, Cuddles is now serving as an emotional support dog to 73-year-old Billy Brauer of Cornwall, N.J.
Cuddles, who had the full battle scars of a dog that had experienced the viciousness of a fighting ring, went to rehab training before she was entered into the TAILS program where she graduated with top honors and earned a Canine Good Citizen title, Crosby said. 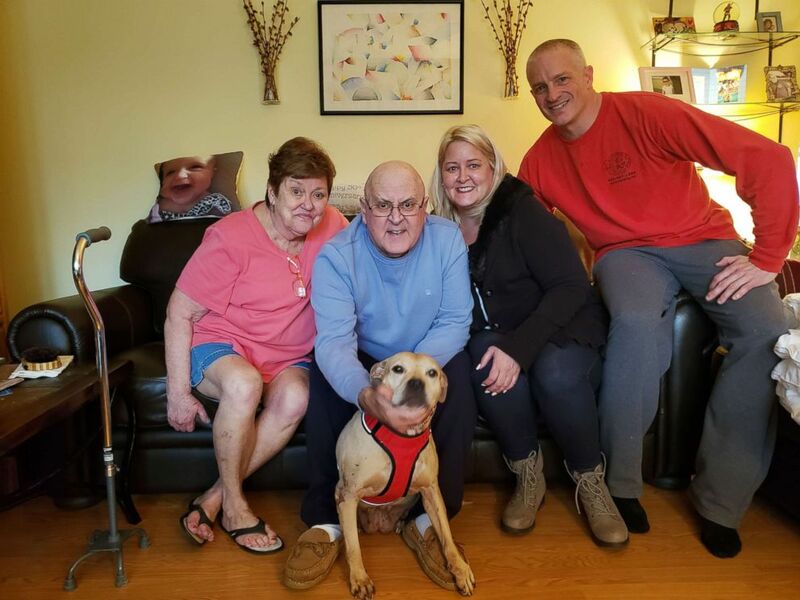 She is now an emotional support dog for a 73-year-old retired firefighter and veteran living in Cornwall, New Jersey, while six of the other dogs who were once sentenced to death now work with law enforcement throughout Florida as detector dogs for bombs and drugs, Crosby said. "Those dogs that were once gonna be killed are now saving lives," he said. And graduation time is always emotional, Deane said. "I've seen tears -- these big, tough guys crying when their dogs graduate because they love them so much." Three sets of graduations are coming up in February. After that, it's on to the next set of dogs, whom Deane tries to get situated "as quickly as possible." "I can't think of any other creature that is so forgiving." Crosby, a retired lieutenant for the Jacksonville Sheriff's Office, not only assesses all of the dogs who participate in the program but is also called to duty all over the country to evaluate whether seized dogs are safe to be around humans. Crosby is often called to testify in cases in which a dog kills a human and said that he's only met a handful dogs who he believed were a danger and couldn't be rehabbed. "It never surprises me when humans do something terrible to dogs," he said. "But it’s very, very rare that dogs kill a human." (AGoldPhoto Pet Photography) Dogs from the Teaching Animals and Inmates Life Skills program, or TAILS, interact with inmates at the Putnam Correctional Institution in Palatka, Fla.
Crosby said dogs are "incredibly forgiving of things that we have done to them in the past." Rehabbing and training "even the most frightened or aggressive dog" is a matter of taking the time to build trust that "goes both ways." "You can accomplish incredibly surprising things -- incredibly positive things," he said. Crosby described working with TAILS as an "incredible opportunity," especially given his past law enforcement experience. Now that Crosby spends time with inmates who aren't necessarily aware of his previous job title, his view on "what we can do for inmates" has changed. "I spent years just simply throwing them in jail, throwing them in prison for doing bad things, but I never really thought about what happens later," he said. "I just assumed that whenever they got out, I'd be seeing them again. They would do something, and I'd be putting them back in prison." Crosby has witnessed how the dogs, "especially the ones from damaged backgrounds," connect with the inmates and change their behavior by teaching them mutual trust, mutual caring, compassion and empathy.